option for a guaranteed RS build slot. Perhaps this will change a bit later...as the demand is absolutely incredible. I'm fortunate to be able to do it. ..Life's too short, had to be done. Awesome car, at a bargain of a price given the alternatives and how they stack up price-wise. Vantage GT3 anyone..? ?, oh, hold on, they only made about 3 of them and they're all sold to middle-east oil barons. What else can you get with this level of performance, history, design integrity, for anywhere near this price? Happy days if you made the cut - I just hope their vetting process was/is robust enough to ensure enthusiasts like Nick W get the nod over the speculating chancers looking to turn a quick profit. Looks one hell of a car. Gav, have you moved AND bought another car? I must have missed your memo! I hope OPC's have the same issue. 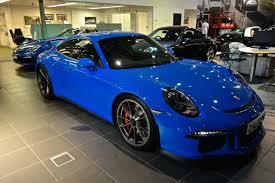 Porsche want these cars to be used as designed, not stuck under a dust sheet in a collection. Well I hope thats the case anyway..! Yep that looks a good colour. I love that Evo video, gives a really good summary of the car. The grip levels sound totally out of this world. The 991 GT3 was a game changer, this will be a bigger step forward. totally totally bonkers. Agree with Cunno on the pricing though. I cannot understand why Porsche didn't sell this at £180. It would still be sold out before launch, and would hopefully cut down on the speculators a little. Fantastic car - Do Porsche still lose money building these like they used to?? ie - the GT2/3 and GT2/3 RS are partly about building halo products for the entire range..